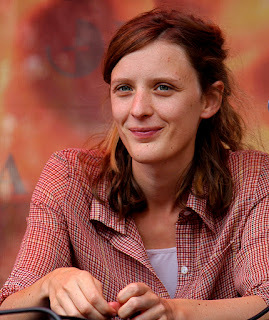 Mia Hansen-Løve began her film career as an actress, when she was plucked from obscurity by director Olivier Assayas (whom she later married) to act in his films Late August, Early September and Les destinées sentimentales, and she subsequently wrote for Cahiers du Cinéma, but she only really found her voice when she stepped behind the camera herself. After making her directorial debut in 2007 with All is Forgiven, Hansen-Løve confirmed her potential with the devastating drama The Father of My Children in 2009, which was loosely based on the life of French film producer Humbert Balsan. Her third picture Goodbye First Love similarly has its roots in real life, but this study of young love lost is the director's most nakedly personal film yet. I met Mia Hansen-Løve in London recently to talk about it. There seems to be a consistent theme in your films to date of people trying to move on from events that have affected them in the past. Is that a coincidence or is it a theme you consciously wanted to explore in each picture? It's not a coincidence at all, I think. When I wrote the first one I had no idea what the second one would be, and when I wrote the second one I had the idea for the third one but I wasn't sure if I would ever write it. I felt unable to write it. It's only afterwards, having made these three films, that I realise it's like only one film that I made in three parts. I'm not saying they're the same story, because they're totally independent films, but the energy and inspiration comes from the same source. With this film, I didn't feel like I was exploring the same themes again in a different way, it was more like...OK, this may be a stupid and funny comparison, but it's like Star Wars. [laughs] They make three films and then afterwards they make the first one. The prequel, that's it. In a way, Goodbye First Love is the prequel to my other films, but I could never have made it as my first film. It was there but I wasn't aware of it. When I was looking for money for The Father of My Children, I hated waiting so much I started working on Goodbye First Love, but it was very painful at this time and I couldn't imagine telling the story from the girl's point of view. I was telling the story from the boy's point of view, but that was impossible. I could not project myself into him in South America and it was just impossible, so I left it. After I made The Father of My Children I went back and looked at this, and then I just threw everything in the garbage. [laughs] I started all over again and I had to face the fact that if I wanted to tell this story I would have to be with the girl from the beginning to end of the story. It was the most difficult film to write, actually. I mean, The Father of My Children was not an easy film to write in terms of the maturity that you need, or because it's the complex world of a producer and a world I didn't know that well. Maybe The Father of My Children was more difficult to write technically, but in terms of how you feel about the material, it was much easier to write than this one. Was one of the challenges to find the right balance as you show the progression of time over so many years and to decide when to revisit these characters at certain points in their lives? Yes, but it was very intuitive. The passing of time is something that was at the heart of my inspiration since the first script that I wrote and it felt like something very natural to me. In a way, I think it's more natural for me to tell a story that stretches over many years than to tell a story over a very short time. You know, after every film I have thought, "Oh, it would be so nice to make a film that happens over a weekend and to stop with this passing of time thing," but I can't avoid it with every film. It's just my way of expressing myself. It's not like I thought of it as a challenge of something, I just don't know how to tell a story in a different way. There are films I love that only take place in one day or one week, and I feel jealous because I can't do it! [laughs] The only way I know how to express the feelings I want to express through my films is by showing different moments in a life and the way the past resonates into the present, to show the connection of this moment. Maybe it's because I want the viewer to experience the same things as the character. The way you handle time also feels very natural and fluid. There are no title cards saying "Two years later" and instead it's suggested in subtle ways so we gradually sense where we are in the story. I guess it's because that's how I feel about the passing of time in my life. It's impossible to catch the moment when you move from one stage to another, it happens so progressively, it's so fluid all the time, it's like water. I think the film is really about that. Was it difficult for the actors to portray these characters over such a long period of time? Yes, I think so. I think they must have been kind of anxious about that. We didn't talk so much about that but I tried to make them not worry about it at all. I don't like it when the actors start to worry about things. All filmmakers have their own method, but the only way I can get things from the actors is through the trust and confidence I have with them. Everything I have got from the actors in my films has to do with the fact that I tried not to make them worry about their performance, and I always gave them the feeling that there would be no problem. Some filmmakers achieve great things through conflict and brutality, but I can't work like that. I try to make them forget that it's a big deal and to always be present in the scene; I never film the past as past, I always film it as present. When I'm here talking to you, I am in this moment, I am not thinking about the past. That's one of the things that's notable about your films, the natural quality in the performances. It's like they're not acting at all, you've just caught their natural behaviour on camera. I think it has to do with the fact that I make a lot of takes, and the reason I do this is not just to torture the actors [laughs], but because at one point they let it go. When actors get tired or bored you can find some great things because they forget being actors and you can get something deeper from them. It doesn't always work but it's worth trying, and most of the time I find that I use either the first take or the last one. Did your own experience as an actor determine the way you direct actors now? Well, when I said that the one thing I believe an actor needs is trust, I think that came from my experience of Late August, Early September. I wasn't an actress, I was just in high school on a theatre course when it came to me. I wasn't involved in cinema at all and I wasn't self-assured, I mean, it's not like I always wanted to become an actress. I loved it. I loved it so much, but I loved it because he trusted me and his trust gave me incredible self-confidence. I never found that again as an actress, it was just in these two films with Olivier, but I think the relationship I have with actors has to do with the gratitude I have for this experience of Late August, Early September. So you had no ambitions to be an actress, but had you thought about being a filmmaker before you met Olivier? I met him when I was 17 and started to think about becoming a filmmaker when I was 21. From 17 to 20/21 it was really about writing and studying, but I felt I had lost this great experience that I had on set and I had no other great experience like it. I wanted to find this sense of freedom, self-confidence, creativity and artistic fulfilment that I had seen in him, it was so desirable to me. It took me some years to imagine becoming a filmmaker myself, because it wasn't something obvious to me. I am always amazed when I see so many filmmakers who say they always wanted to become a filmmaker, like since the age of 12, but for me it was so far away. As a child, an adolescent or a young adult, it wasn't something I imagined. Were you a cinephile growing up? I became one, but after Late August, Early September. The first connection I had with film was this physical experience on set, which had an incredible intensity of feeling that has never left me. It's like you are only alive on set, which is a good thing and terrible too. That was why I made The Father of My Children, because I felt so connected with the producer and he thought that films were life. It's great, because when you are in the process of making the film you live with such intensity, but when the shooting is over and you go back to your life it's kind of tough. Is that why you make films so quickly? You directed your three films in five years. I think it gives me a lot of energy and determination to make another film, but I think it will become a problem. I would like to write all of my own films but I'm not sure I can continue to write my own films every two years. What about your use of architecture in the film? Does the way the character finds herself through architecture act as a metaphor for how you discovered yourself through filmmaking? Yes, you can say it's a metaphor for cinema and make a parallel for many reasons. I could have made her become a filmmaker, but I had just made The Father of My Children, and the one thing that was exciting about that was that it was films from the production perspective and not the filmmaking perspective. It was totally new territory and the great thing about making films is that, even if I write an autobiographical film, it allows me to explore the world and learn new things. Some of my friends are architects and we have a lot of discussions that I find fascinating, and this was a way to learn more and explore more, and to educate myself. I guess another big area of interest for you is music, because you always have interesting soundtracks and your musical choices are often very unusual given the context of the scene. It's because I know you are my last interview of the day and I want to say everything! The last thing that's very important to me about the use of music is that it should come from inside the scene. In most of the scenes in my films, the music that you hear is also heard by the character in the scene, it's very important to me. It comes from inside the screen and sometimes I let the music continue in the next scene a little bit, as if it was resonating in the character's head. To me, I am kind of allergic to the idea that something comes from the outside and you don't experience the same thing as the characters. I want the music to be part of the world of my characters and not something disconnected. I read a quote from you that said, "The more style fades and disappears, the more it is erased, the more it creates a style of its own." It seems to be important to you that you remove any visible sense of direction from your films. Yes, that was a choice from the start. Maybe at one point it will change, because I guess everybody changes, but at the moment I'm at the same point. I don't want to impress people with my style, and even if I wanted to I don't know if I could. Form is extremely important to me, questions of how to film, the rhythm, the colours, it's there all the time, but I'm not looking for easy solutions or flashy solutions. I think sometimes for young filmmakers it's easy to make a radical choice but it's also a way to avoid asking yourself questions, although I enjoy a lot of those films. When I started I asked myself if I should make choices like only using a handheld camera, or make every scene only one long take – but why should I do that, just to impress people? To make it easier for them to write about it? I don't think I make the kind of films that make people go "Wow" but my obsession is to have people totally forget about the style and just have a feeling of reality. It's a style itself, this appearance of lack of style. One of the actors you've used in your last two films is Magne-Håvard Brekke and he's somebody who doesn't make many movies. Can you tell me about working with him? I enjoy so much working with him and I think it's because he's like a child, because he hasn't been in many films. Actually, I don't think he's very proud of this, but I think he was a child actor when he was five or something. He told me that once. After that, his career has been in theatre in Germany, he has been a great actor in the theatre, but he has never been in front of the camera and he has such an incredible innocence, like only children have. To me that's very precious, the fact that he's not aware of his presence or charm, it's not something he plays, he's just like that. There are a lot of great actors who I like a lot, but I really appreciate this kind of innocence, especially when it comes from an adult because it's so unusual. I'll give you an example that's typical of Magne. There was a scene where he had to come into a room, and Lola was in the entrance so he smiles at her, and I did so many takes but couldn't get the smile. I said, "Magne, is this really so difficult for you, what's the problem?" and he told me that he was doing his most beautiful smile to Lola and couldn't understand what he was doing wrong. Finally, I realised that he was doing it but at a place where there was no camera. He had no idea where the camera was! [laughs] That innocence is really connected to what I like about him as an actor. You spent some time writing about films for Cahiers du Cinéma. What was that experience like? It's kind of a French tradition going back to the Nouvelle Vague for filmmakers to start as critics. One woman you have worked with on your three films to date is your editor Marion Monnier. Can you tell me how that relationship works and how you work together to construct the film? She is my alter-ego. She's the only person I have worked with on my three feature films and she's the person I feel closest to in terms of artistic complicity. She's exactly my age, we have the same tastes, we are very close. I'm there from the first hour to the end with her, and we always talk a lot during the process of shooting too. I enjoy it because of this relationship and because editing is very addictive. I prefer the shooting, this is the most beautiful moment, but because I make so many takes we have a huge amount of material to work with. It's not like we have only one or two takes and we have to find the best solution, it's really like a re-writing and it's fascinating to work on that. Actually, I'm very sad when the editing is over, and I try to make it longer, "Oh, let's try it another way." [laughs] It's also about the movement and rapidity. I love to work on the concision and fluidity, and one idea we share is that we don't like to let the scene start and finish. It's not like a gimmick, but just a feeling of starting the scene a few images or a second after you might expect, we work very hard on that. It's hard to explain in English. I guess it gives a sense of scenes and these characters' lives continuing beyond what we see in the movie. Yes, it's a great thing to work on. It's not about the speed but the fluidity of movement as you go from one scene to another, it's such an exciting thing and I enjoy it so much. Marion and I can spend hours looking at just a few images and thinking, "At the end of this scene she puts her bottle of water here, so how can we go to the next scene in the most fluid way?" There are really two types of filmmakers. There are filmmakers like me who are really addicted to editing their films, and there are other ones who just look at it from time to time, even really great filmmakers. I cannot understand that. Especially when it's material that's so personal to you, it must be hard to hand that over to someone else. To me it's totally absurd. The whole point of shooting this material is to be able to make these decisions later. It's like if you had a field and put out all of the seeds and then let someone else take the food. It's not a matter of trust, it's just about continuing your presence in your work, and it's a mystery to me why all filmmakers don't do that. You mentioned Lost in Music as your next film. What stage is that project at right now? Can we expect you to continue your rhythm of a film every two years? No, and I'm so depressed because for the first time I've missed that. Oh no, you've let us down. I've let myself down, it's terrible. But it's a film in two parts so in three years I will have two films, and maybe that will be OK. It sounds like an epic. Yes, this is my Carlos. [laughs] It's in two parts and it stretches over twenty years. It starts in 1992 with the first raves in France, and it ends today. It's the life of a DJ. I edited the script in November and I am hoping to shoot in February 2013, but it's hard for me to wait. It sounds like you're getting more ambitious with every film.